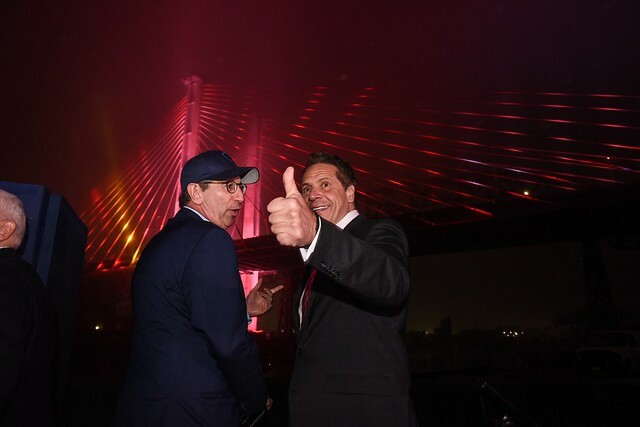 Governor Andrew M. Cuomo today premiered the "New York Harbor of Lights" following the grand opening celebration of the first span of the new Kosciuszko Bridge – the first new bridge constructed in New York City since the Verrazano Bridge in 1964. The spectacular light show, which was coordinated with lights on the Empire State Building and synchronized to music airing on multiple iHeartRadio stations, marked the first performance in "The New York Harbor of Lights." Building on the state’s burgeoning tourism industry, the multi-color LED light shows will transform New York's magnificent structures into world-renowned tourist attractions, drawing even more visitors to the Empire State and driving the economy of the metropolitan area. "As we continue to move New York's bold infrastructure plan forward, we are setting a national model for safe, reliable transportation, while bolstering the state’s tourism industry and driving the regional economy," Governor Cuomo said. "This remarkable light show across the New York City skyline symbolizes the connection and strength of communities across the region." Born This Way by Lady Gaga. This remarkable light show across the New York City skyline symbolizes the connection and strength of communities across the region. The George Washington Bridge is also included in “The New York Harbor of Lights.” The lights will have ability to be coordinated to music and to one another for special events. The shows will significantly boost the state tourism industry, which already sees $63 billion in direct visitor spending annually – a $9 billion increase since 2011. Earlier today, the Governor announced the completion of the first span of the new Kosciuszko Bridge, which will officially open to traffic in both directions at 11:30 p.m. Thursday, April 27. The Kosciuszko Bridge project is replacing the existing 78-year-old bridge, which first opened in 1939 under President Roosevelt’s administration. Once complete, the new bridge will consist of two state-of-the-art, cable-stayed bridges, one Queens-bound and one Brooklyn-bound. The $555 million Phase I project is the largest single contract the New York State Department of Transportation has ever undertaken – resulting in the construction of the Queens-bound bridge, which includes three lanes of traffic in each direction until the completion of Phase II. The new bridge will benefit approximately 200,000 commuters each day and has a service life of 100 years, ensuring its viability well into the future. In addition, the Governor announced plans in February to implode two major sections of the old bridge this summer, clearing the way for Phase II of the project to begin in May of this year – a full seven months ahead of schedule. This will move up the expected opening of the Brooklyn-bound span to early 2020, a full four years ahead of schedule.